The year 2018 is an eerily apposite year to be recalling equality issues in British history and society, and in British systems and institutions of education. One hundred years since the Representation of the People Act 1918, and ninety since the Equal Franchise Act 1928. Seventy since the Universal Declaration of Human Rights 1948 and since the symbolic birthday of multi-ethnic Britain, that same year, with the arrival of SS Windrush. Fifty since the assassination of Martin Luther King and since Enoch Powell’s Rivers of Blood speech in 1968. Thirty since the Human Rights Act and the infamous Section 28 of the Local Government Act 1988, and since the Fair Employment and Treatment Order (FETO) came into force in Northern Ireland, making it unlawful to discriminate on grounds of religious tradition. FETO was later amended and expanded to include other strands of equality too, and thus helped prepare for the Equality Act 2010 in England, Scotland and Wales. 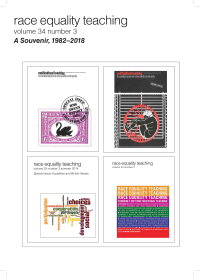 And now in 2018 there is the demise, after 36 years, of a precious resource and reference point for equalities in education, the journal Race Equality Teaching (RET). Next What U Lookin @?